The Monday evening of the 29th Oct 2007 marked the official launch of Cookstown District Council's publication, Cookstown's War Dead 1914-1918 & 1939-1945 in the town's Burnavon Arts Theatre. The launch, which was attended by upwards of two hundred people from across and beyond the district, was the culmination of three years work to produce an all encompassing publication to document the efforts of the men and women from the district who died in the First and Second World Wars. 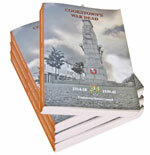 The book is available from Cookstown District Council Offices and The Burnavon, Cookstown from Friends of the Somme (Mid Ulster Branch), and local booksellers including Sheehy's Newsagent, Cookstown. Speaking at the event, Chairman of Cookstown District Council, Cllr Ian McCrea MLA said: "It is important that we never forget the role played and sacrifices made by so many in safeguarding and securing the liberties we now possess, and all too often take for granted. "I believe that Cookstown's War Dead will go some way to preserving the memory of those who paid the supreme sacrifice, selflessly leaving these shores never to return. The book will act as a learning resource which will no doubt be drawn upon by future generations, standing as a testament to the part played by so many of our citizens." The project, though spearheaded by Cookstown District Council, was driven forward by a committee comprising of members the Friends of the Somme (Mid-Ulster Branch) with help from local clergy and members of the local Royal British Legion.